The Charles River is of great recreational and ecological value to the Boston metropolitan region and the Commonwealth of Massachusetts. It is also the focus of the U.S. Environmental Protection Agency (USEPA) Region I, Clean Charles 2005 Task Force. The main goal of the Task Force is to make the Charles River "fishable and swimmable" by the year 2005. Achieving "fishable and swimmable" conditions will require continued progress in addressing a range of environmental conditions now degrading water quality, including the infiltration of saltwater from Boston Harbor into the freshwater Charles River. To better understand the pattern of saltwater intrusion, the U.S. Geological Survey (USGS), in cooperation with the U.S. Environmental Protection Agency (USEPA), Massachusetts Department of Environmental Management (MADEM), and New England Interstate Water Pollution Control Commission (NEIWPCC), collected data on the spatial distribution, temporal variability, and chemistry of the saltwater that entered the lower Charles River from June 1998 to July 1999. 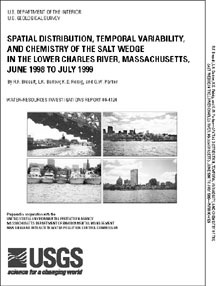 The purpose of this investigation is to extend and complement a regional-scale study of Charles River water quality conducted in 1996 (T. Faber, U.S. Environmental Protection Agency, written commun., 1997), and the ongoing water monitoring activities of the Massachusetts Water Resources Authority (MWRA) and the Charles River Watershed Association (CRWA). The data collected by this investigation supports the Clean Charles 2005 Task Force by providing detailed information concerning a major factor limiting "fishable and swimmable" conditions in the lower Charles River. Finally, the study will be used to assist current planning efforts of the Metropolitan District Commission (MDC) to restore the historic parklands of the lower Charles River. The "Basin" is the local term for the reach of the Charles River that begins at the Watertown Dam in Watertown, Mass., and extends about 8 mi through suburban and urban areas to Boston Harbor. Discharge to the harbor is controlled by the "new" Charles River Dam in Boston (fig. 1). The Basin was created by construction of the "old" Charles River Dam in 1908 to solve Boston's sanitary problems. Prior to the building of the old Charles River Dam, the lower Charles River was a tidal estuary in which the water levels rose and fell twice daily with the tidal cycle. Low tide would expose untreated sewage that was discharged directly into the river. Exposed sewage created noxious odors and served as a breeding ground for mosquitoes that caused sporadic epidemics of malaria and yellow fever (Jobin, 1998). Damming of the river interrupted the normal tidal cycle and flooded the estuary by creating a freshwater pool (the Basin) that had a constant water elevation of about 0.8 meters (m) above mean sea level. Flooding of the estuary initially improved sanitary conditions and the Basin became a source of enjoyment for the local population and the focus of a large waterfront park in Boston and Cambridge (Jobin, 1998). Although the infiltration of saltwater from the harbor into the Basin was anticipated when the old Charles River Dam was built, neither the magnitude nor the consequences of the infiltration was considered. By 1975, the Metropolitan District Commission (MDC) determined that harbor water covered about 80 percent of the river bottom within the Basin and composed about 50 percent of its depth. The MDC also concluded that fish kills and odors in the spring of 1975 were likely the result of the sulfide-rich saltwater mixing with the overlying freshwater (Metropolitan District Commission, 1975). Saltwater from Boston Harbor that enters the Basin is known as the "salt wedge" because of the shape it assumes as it moves upstream. Freshwater discharge from upstream pushes against the intruding harbor water until the density differences cause stratification to occur; the freshwater then overrides the denser harbor water (Fischer and others, 1979). The depth from the river surface to the top of the salt wedge is directly related to the force of the upstream flow and inversely related to the difference in density between the freshwater in the Basin and the harbor water. As the freshwater flows over the harbor water, shear stress develops at the freshwater-saltwater interface, which causes the upper surface of the salt wedge to form a slope that reflects the dynamic equilibrium between freshwater discharge and saltwater intrusion. The "new" Charles River Dam was built in the late 1970s as a replacement for the old dam. Features that were meant to significantly reduce saltwater intrusion of harbor water into the Basin were incorporated in the design of the new dam, and reductions of harbor-water intrusion by as much as 80 percent were predicted (Metropolitan District Commission, 1975). Special features of the new dam included small locks with tight seals and two sluice gates. One of the sluice gates is 6 m below the water surface and was designed to drain the salt wedge at low tide. Six large pumps control the water level in the Basin during flooding, and could be used to pump the salt wedge out of the Basin. Each of these pumps is capable of pumping about 40 cubic meters per second (m3/sec) of water from the Basin into Boston Harbor. Although the new dam was designed to reduce the infiltration of harbor water into the Basin, its present-day operation results in large volumes of harbor water entering into the Basin, particularly during times of high-recreational boating use. When the gates of the locks are opened to allow boats into or out of the Basin, freshwater flows out of the Basin over the same volume of harbor water infiltrating the Basin. It has been estimated that about half of the volume of water in the lock enters the Basin during each lock cycle (a lock cycle is composed of two lock openings ‹one for a boat entering the basin and one for a boat exiting the basin). There are three locks at the new dam: two small locks (61.0 m x 7.6 m) and one large lock (91.4 m x 12.2 m). Assuming that each lock is used for one-third of the lock cycles and given that the observed average height of water is 3.4 m in the small locks and 4.6 m in the large lock, about 136.7 cubic meters (m3) of harbor water enters into the Basin per lock cycle. The presence of the salt wedge can have profound effects on geochemical conditions within the Basin including: (1) increased salinity, (2) decreased oxygen concentrations, (3) increased production of hydrogen sulfide, (4) sequestration and immobilization of trace metals, and (5) increased internal loading of nutrients, such as phosphorus. All of these changes affect organisms that live within or pass through the Basin, especially benthic organisms and fish. This report is presented as a 34" by 44" plate report in Portable Document Format (PDF). Because of the report's complex structure and inherently visual characteristics, a fully 508 compliant pdf could not be generated at this time, but a compliant pdf of only the report text is presented for readers with visual disabilities. To view and print report you need to use Adobe Acrobat Reader, available as freeware.